This was the first DXpedition where Mika was able to test his new JRC NRD-545 DSP receiver, the first of its kind shipped to Finland. 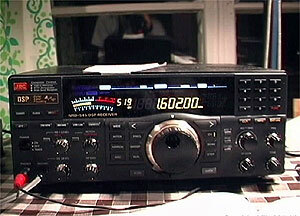 Jim had the previous model, JRC NRD-535D. Unlike in Lapland, both were using just one receiver. The net is full of reviews of the NRD-545 DSP, so I won't go into lengthy details, but just a few observations from the point of view of an AM heavy-user. In my opinion, the receiver is not essentially better than the 535. Sure, sensitivity is OK, but the dynamic range leaves room for improvement; at least my old NRD-535 handled problems caused by strong signals better than the new 545. Internal noise is strong, and the digital filter doesn't seem to suppress unwanted co-channel interference as well as it should. The good news is that the adjustable bandwidth works well. Also, in a hectic situation the 545 is a pleasure to operate, not least because of the 1000 memory channels. At last you can store all the necessary frequencies in the memory. I haven't done any measurements, these observations are based purely on using the receiver in action. As to the antennae, Långåminne is equipped with three beverage antennae of about 800 meters in length directed to 1) Spain and South America, 2) United Kingdom and 3) the East Coast of North America.